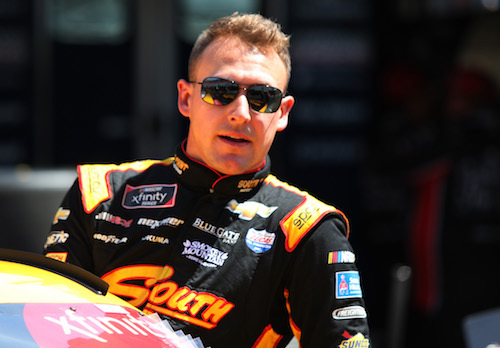 Daniel Hemric will be allowed to compete for the $100,000 Dash 4 Cash bonus in the April 20 NASCAR Xfinity Series race at Richmond (Va.) Raceway after all. Hemric finished third to Ryan Preece and Justin Allgaier in the Fitzgerald Glider Kits 300 at Bristol (Ten.) Motor Speedway on Saturday, but in post-race inspection, his No. 21 Richard Childress Racing Chevrolet was discovered to have right-rear toe that was outside NASCAR’s allowable range. As a result, an announcement was made after the race that Hemric would be stripped of the opportunity to race for the D4C bonus at Richmond and sixth-place finisher Brandon Jones added to the four-driver lineup of Richmond Dash 4 Cash drivers, joining Allgaier, Elliott Sadler and Spencer Gallagher. Although Preece won the race and the Dash 4 Cash bonus at Bristol, he will not race for the bonus at Richmond, because entry lists for that race already has been submitted, and Preece isn’t on it. NASCAR made a second announcement Sunday, though, putting Hemric back in Richmond bonus contention and taking Jones back out. According to the NASCAR rulebook, penalties are only issued for rear toe-related infractions if both sides are out of the acceptable range, and the left-rear of Hemric’s car was within NASCAR spec. “There is a chart in the rulebook, and one side was out of tolerance and the other side was not,” Xfinity Series Managing Director Wayne Auton said. “We called all parties involved and made them aware of our decision. We usually wait until Tuesday, but we made sure we got this out in front of everyone today and everyone aware there is no penalty on the 21 car.